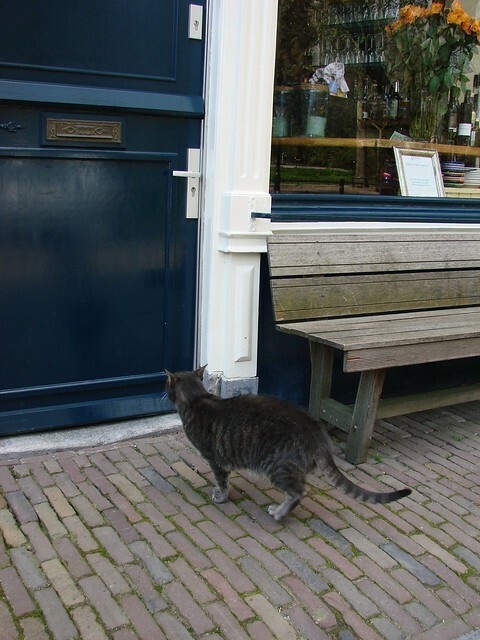 I couldn’t resist a quick snap of the Kloek restaurant cat’s reaction to seeing Charlie walk past. 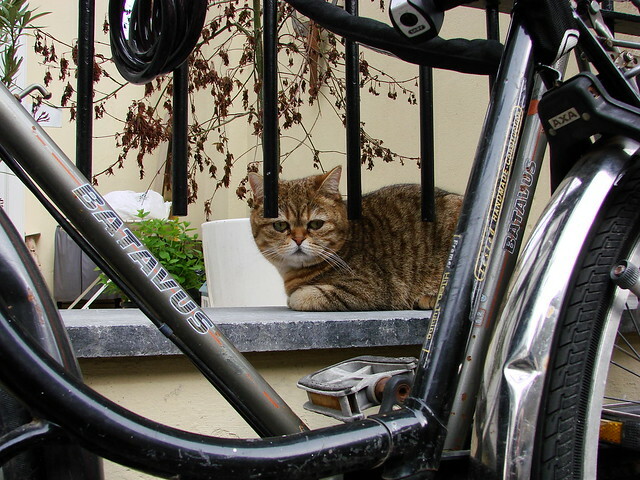 My friend who visited last week is a fellow cat lover, so as we were wandering around town, we invariably caught sight of quite a few cats, indoors and out. 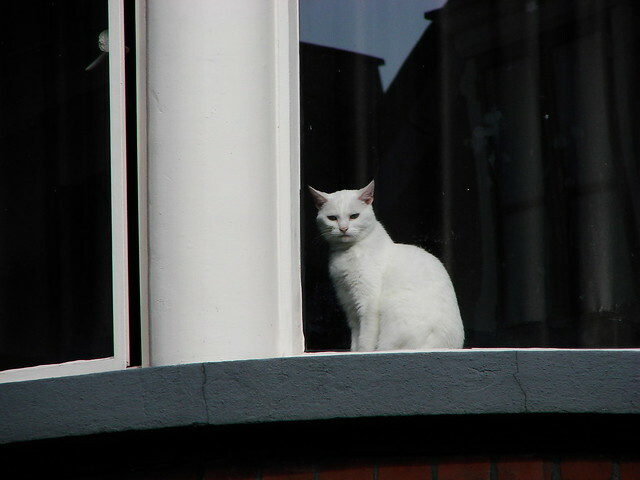 She spotted this one, who was high up on a wall, surveying his domain. 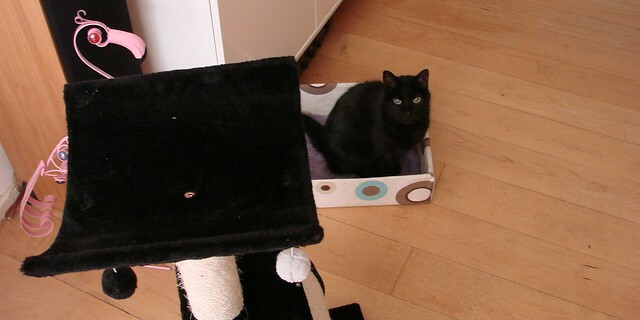 I also took her to Flora’s Hof, with the express hope of seeing a cat. 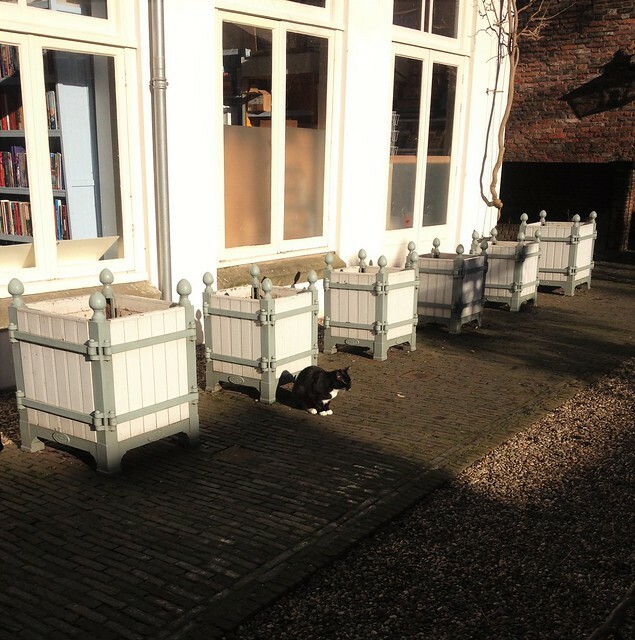 I was originally thinking of the marmalade cat who is usually spotted in this little garden area, but it was a lovely tuxedo cat who was out that day, enjoying a bit of the winter sun. 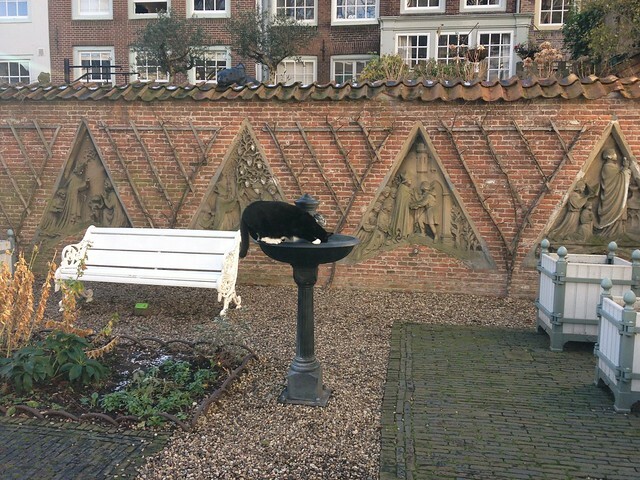 Eventually, he got a bit thirsty, so he headed over to the bird bath for a refreshing drink. He may stalk any birds that come for a bathe and a nice view (and perhaps a few dropped patat), but I wonder if he’s noticed the even larger cat who seems to be stalking him and anyone else in the garden! 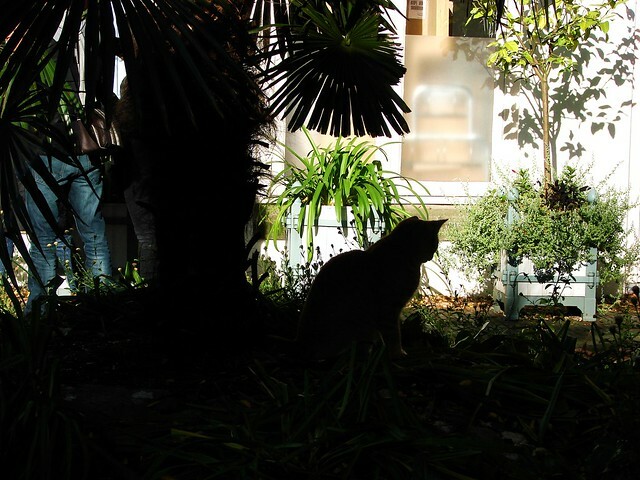 Lurking in the shadows — or on a wall, or under a bench, or beneath a grate, or out a window — at Flora’s Hof and the connecting bookstore, you’re bound to come across a fearless ginger cat. 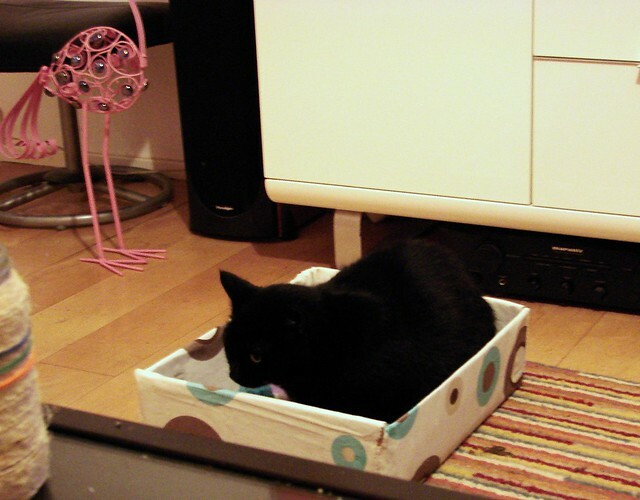 I’ve seen this cat grow from kitten to adult, and it’s always doing something crazy or cute. 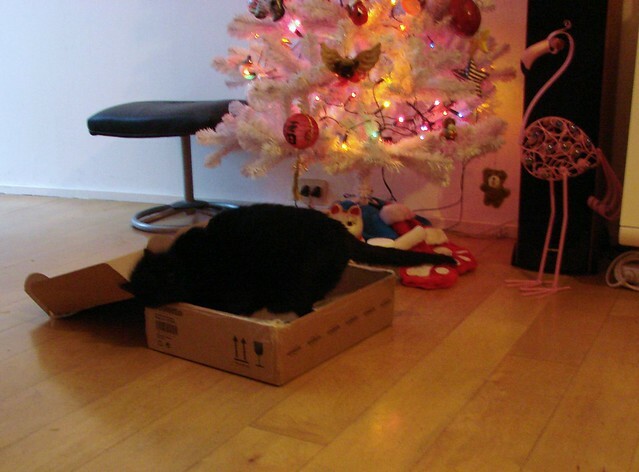 In other words, a classic cat. 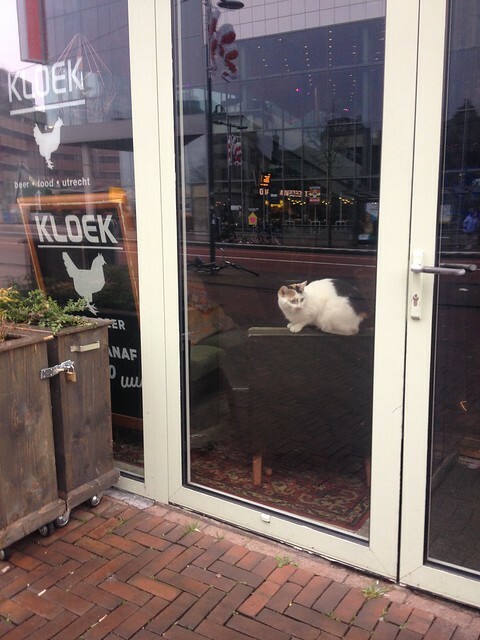 A few weeks ago, while taking the Utrecht Free Tour with visiting friends, everyone got to see this charming cat for themselves. 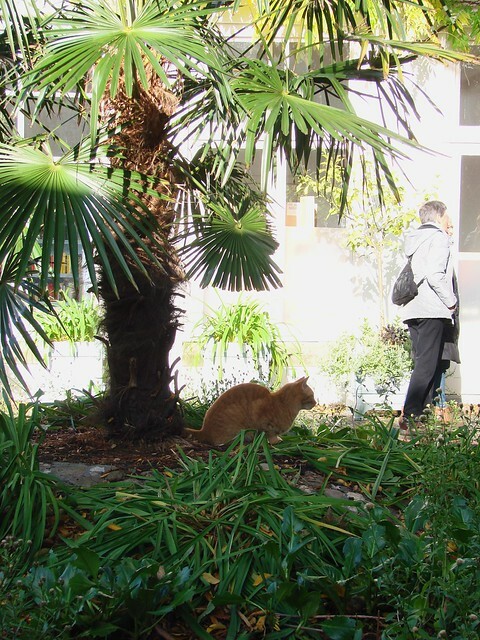 Many photos were taken, especially by my fellow cat lovers, as on that day, the orange tabby was relaxing in the shade of the palm tree in the center of the garden. 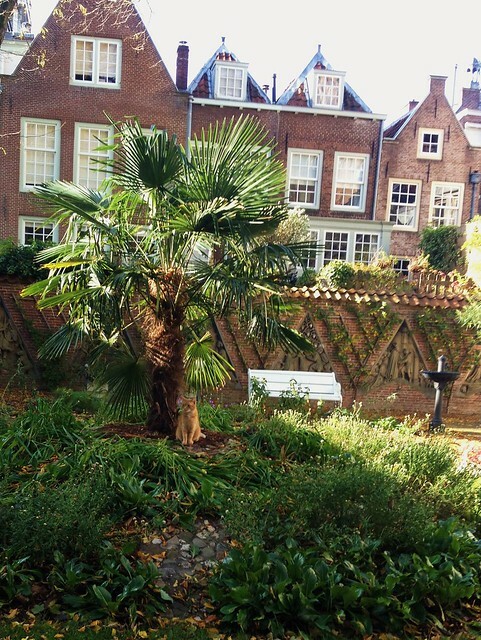 Yes, a palm tree! No wonder it’s one of my favorite spots in town! 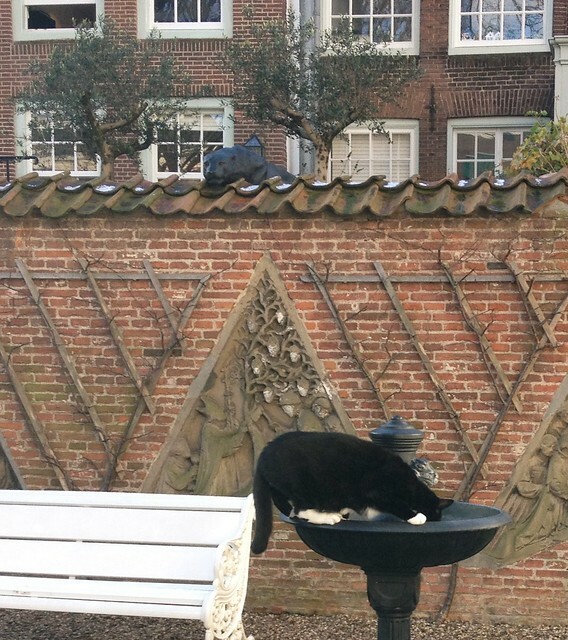 So the next time you’re in the little garden area off Servetstraat, next to the Domtoren, keep an eye out for this crazy kitty. 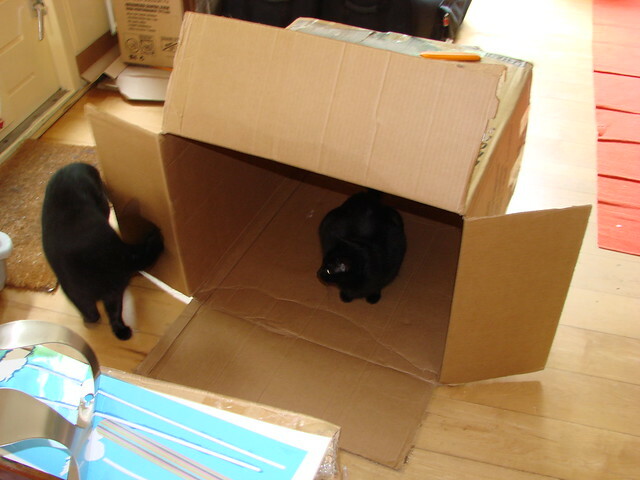 She’ll typically pose for photos, but be fast, as she may suddenly change her mind and race off to parts unknown, through her own secret system of tunnels and bolt holes. 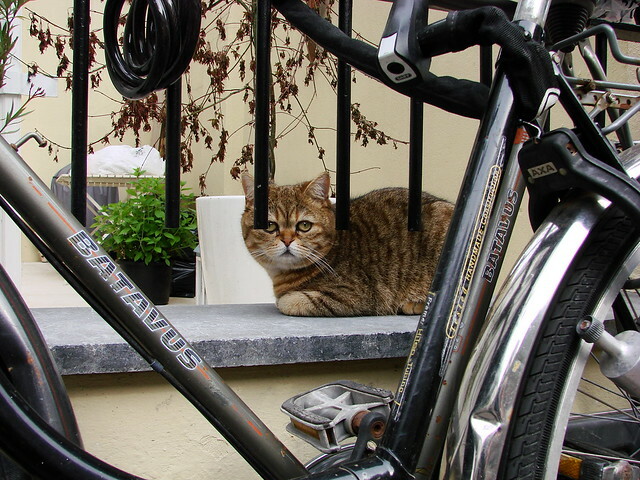 But beware if she’s hanging out in one of the gratings along the garden path. 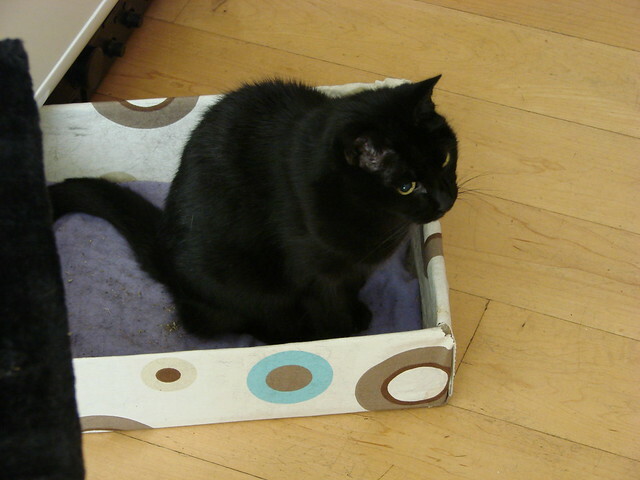 She’s been known to swipe at hands reaching down irresistibly to pet her. Ouch! 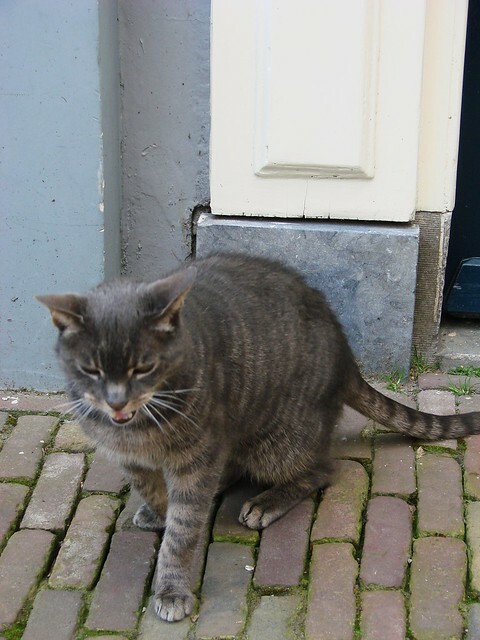 As my visiting friends discovered, Utrecht is full of adorable cats and we were all stopping regularly to admire them. 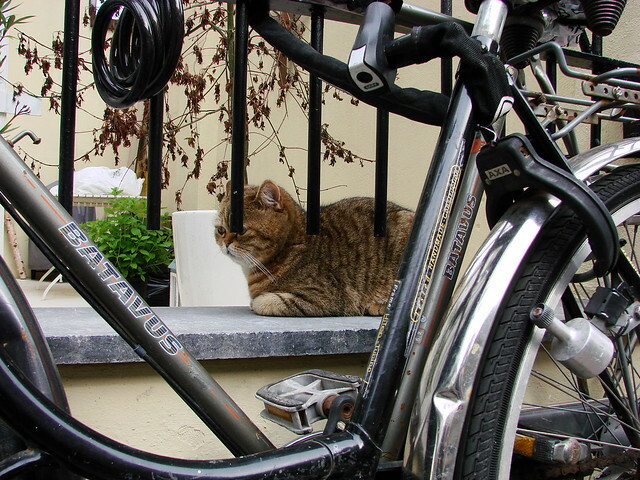 This is one I happened to spot on one of the little side streets off Twijnstraat leading down to the canal. 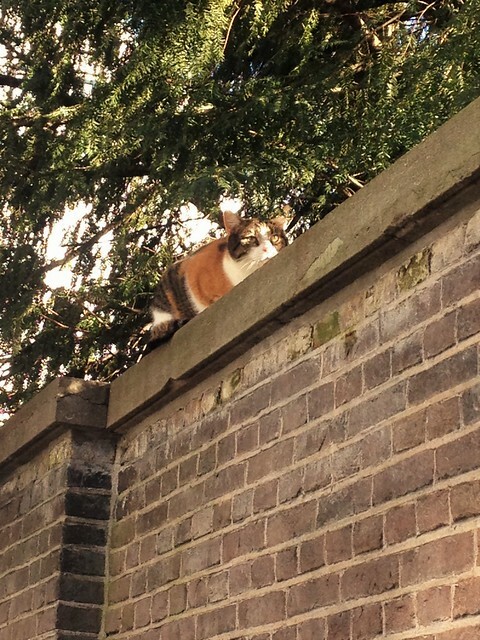 After a good stretch, this pretty kitty looked ready to scale a wall or two. 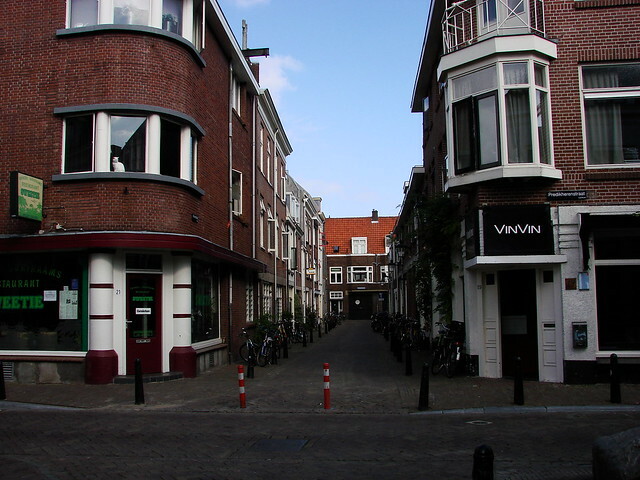 A cute little back street in Utrecht on a sunny Sunday afternoon. The vanishing perspective, the rounded corner of the building, the different shades of bricks … they all caught my eye. But it was the rounded corner building that really grabbed my attention. Particularly the windows right on the curve. 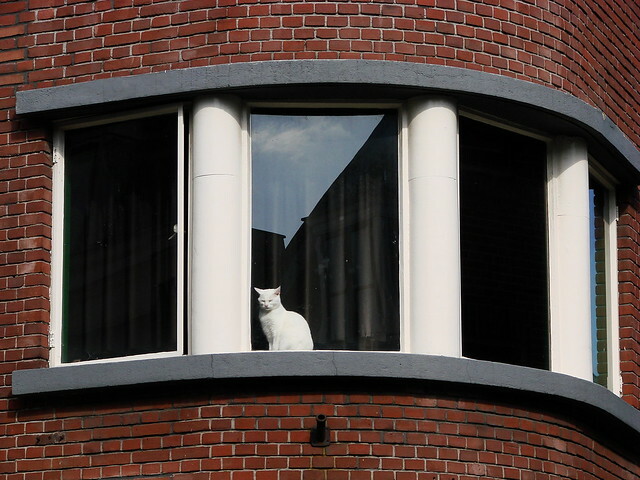 Especially the beautiful — if somewhat disdainful — white cat sitting in the window. My photo on Wednesday of the mask and sewing machine was from a window display of a tailoring shop on Voorstraat. 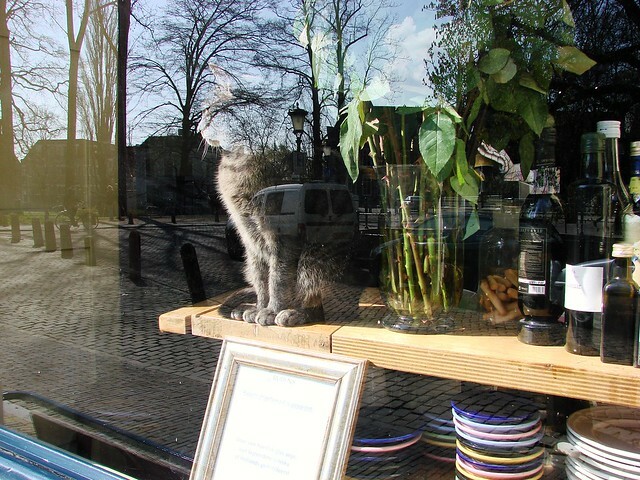 In the past, I’ve noticed their window display more for the cat that is sometimes in the window. 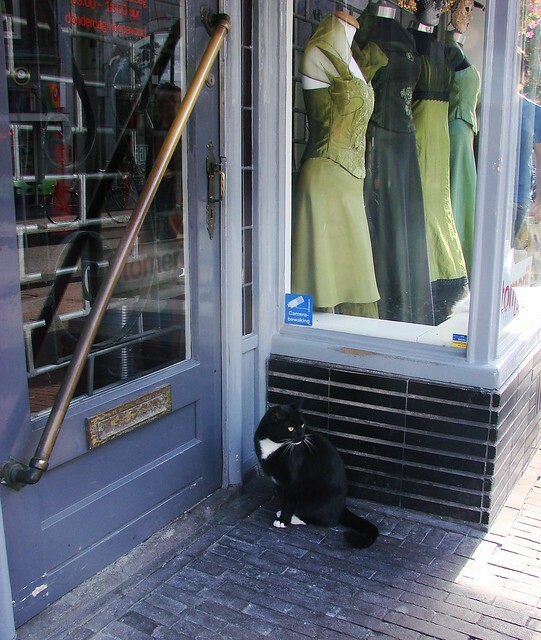 When I passed by recently, it was the mask that caught my eye, but soon enough, the cat suddenly appeared, although this time outside the shop. 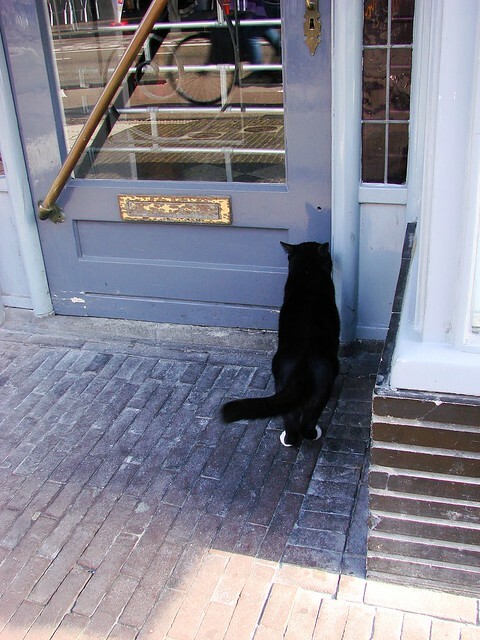 He seemed ready for the shop to open and wasn’t happy about the closed door. Perhaps he had some faulty stitches he needed to pick out from a garment. Regardless, he seemed a bit exasperated that no one was opening the door for him. You could practically hear the frustrated sigh. 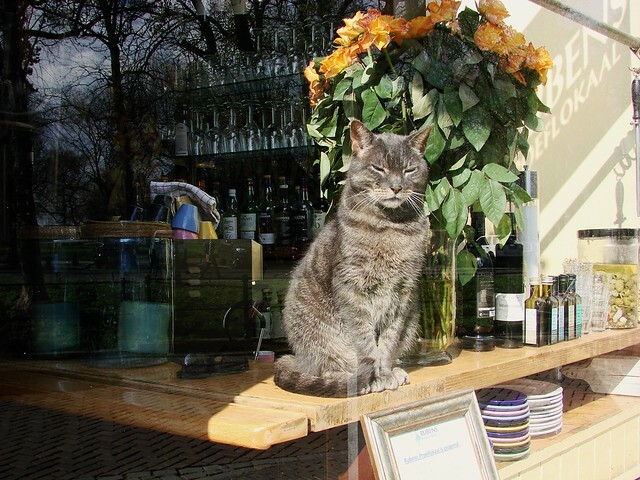 Many shops and restaurants throughout the Netherlands have their own winkelpoes (shop cat) and photographer Robert van Willigenburg has photographed many of them for his series of books called Kat in de Stad. 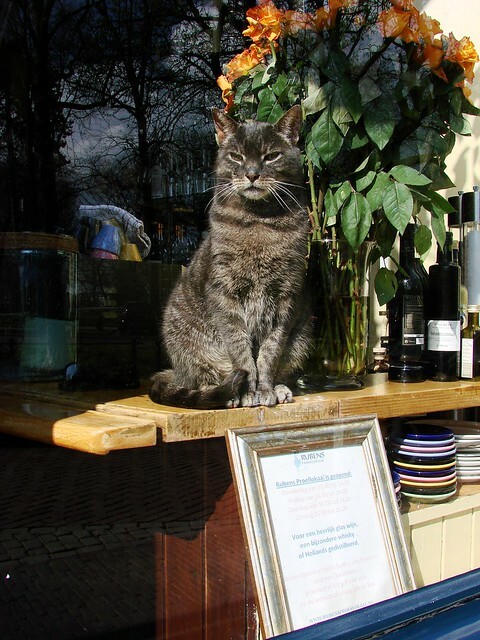 He originally started with the cats here in Utrecht, including a few I know and have photographed myself. 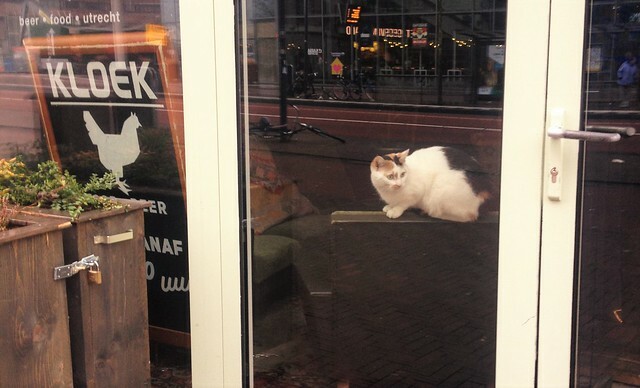 He’s now moved on to some of the many cats to be found in Amsterdam in his latest edition of the book that is hot off the presses. 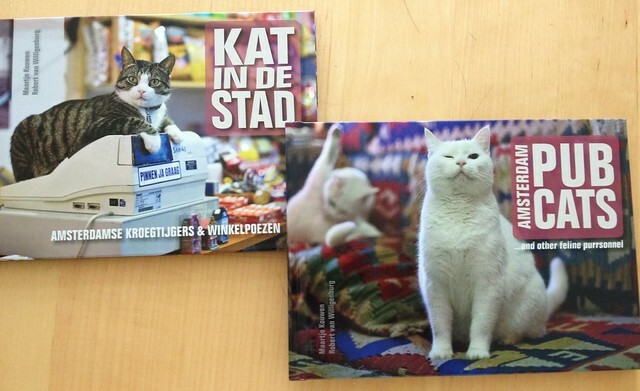 Today is Dierendag, AKA World Animal Day, so give your own animals a bit of extra love and attention and maybe order a copy of Kat in de Stad. Trust me, it’s a beautiful book (in either language) full of entertaining cats. The Zelfgemaakte Markt was back at Mariaplaats today and I was hoping to pick up another print by Studio Ellessi, so I found myself walking down Zadelstraat. 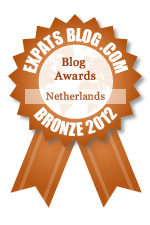 That means two things: Domtorentje chocolates from Theo Blom and the bulldog(s) of De Koperen Bel. 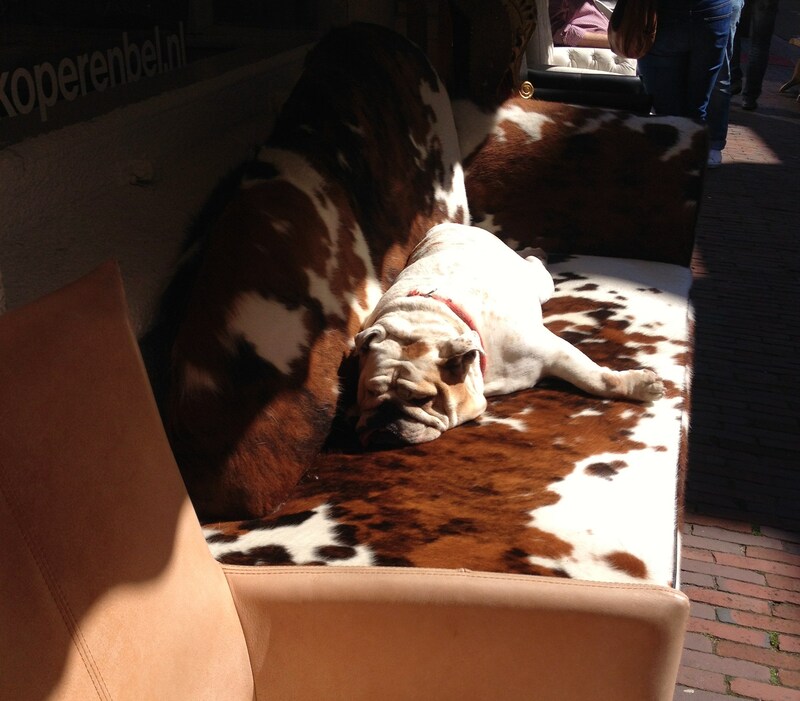 As I approached the shop, I was worried, because I didn’t see any dogs in the usual chairs. But then, lo and behold, there were two squat legs and a white tush staring up at me (yes, it turned out I approached him from behind). When I got to the front end, I knew I’d have to take a quick picture. Sadly, I should have used my proper camera instead of the phone to get a few closer shots. His tongue was sticking out on the left, adding to the whole look of wanton abandon. Fortunately, Nico Arkesteijn, a fantastic photographer here in town got another shot of the dog in the same position, just from a different angle. Go check out the photo and then check out more of Nico’s photos and/or follow him on Twitter. 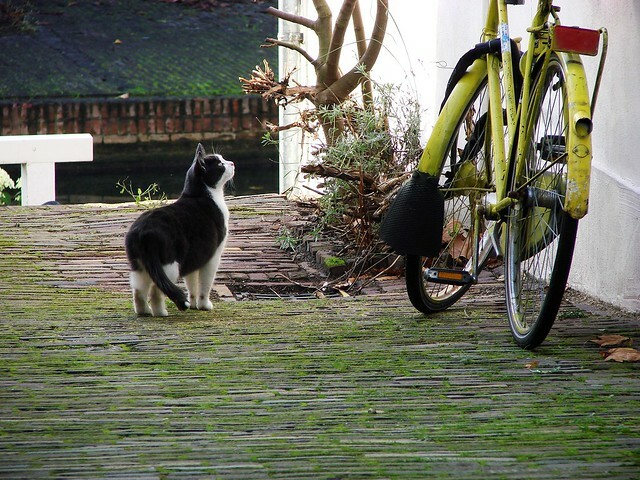 He gets some really wonderful photos of Utrecht. The title of this post was a bit tongue-in-cheek, but before ceiling cat comes down and smites me, I should probably throw in at least one cat photo, just to be on the safe side. 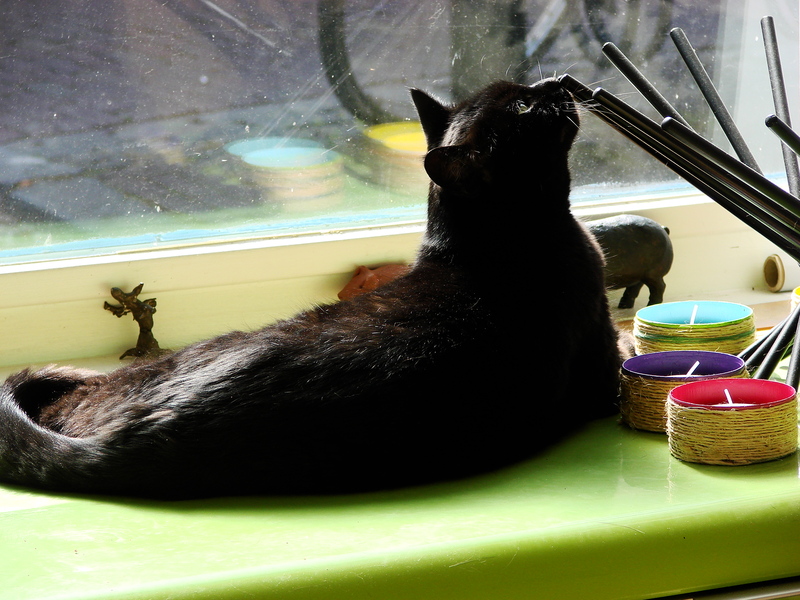 I only saw one cat while I was out today and he zoomed past me before I could even think of taking a photo, so I’ll leave you with a photo of Lola sunning herself in the front window, distracted for a moment by the satellite basket she sees and sniffs daily. 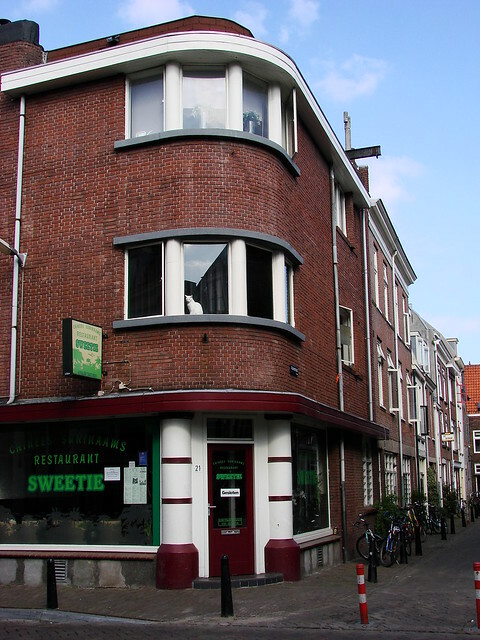 There’s a café near the end of the Nieuwegracht called Rubens Proeflokaal. You can go there to sample a variety of drinks and also take part in courses and workshops. They also have a cat. I’ve seen this cat quite a few times over the years and s/he’s almost always in this one spot, taking in the morning sunshine. When I saw her again this past week, I couldn’t resist a few shots, especially as she vaguely noticed my presence for a change. She usually looks too sun-sleepy to bother. A few hours later, as I passed by again, I saw her in a different spot for once. Not only was she not in that front corner, she was actually outside the café. When she saw me, she started meowing (I caught her mid-meow) and came right up to me, rubbing against my leg. I wasn’t the only one who couldn’t resist her charms, though. Someone else was petting her and photographing her as I approached. 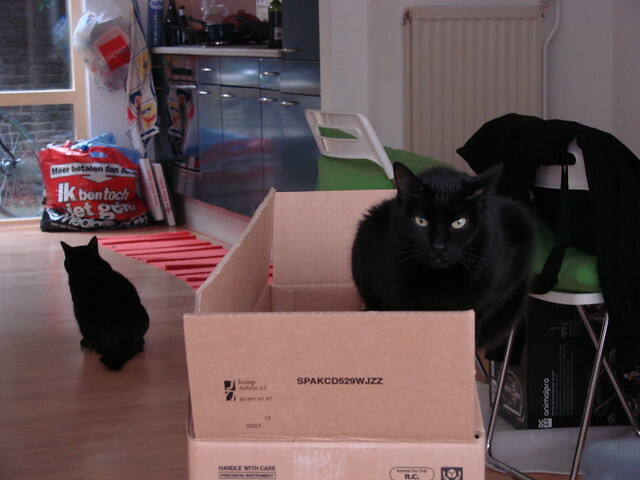 Still, I think she’d had enough of the “paparazzi” as she seemed ready to go back indoors. If only someone would open the door for her.